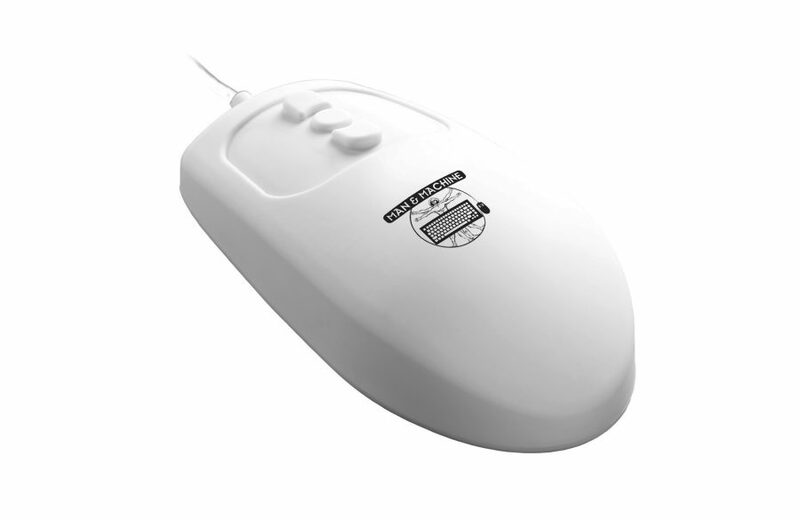 The Mighty Mouse is specially designed for use in medical, factory and marine applications. It is full sized and features a 5-button design for right & left clicking and scrolling up & down just like a conventional mouse. The Mighty Mouse, like all of our premium products has a sealed silicone body and comes with an IP 68 rating meaning that it meets the highest standards for water resistance and dust resistance. We recommend choosing the Hygienic White option if to be used in medical or clinical applications. White makes splatter and bioburden easy to see. It is waterproof and chemical resistant so it can be disinfected with standard cleaners and disinfectants, alcohol and even 10% bleach solution. The Mighty Mouse is ready for dirt, dust and grime. If you are looking for a mouse to be used on a factory floor, industrial assembly line, food processing areas, then the Mighty Mouse is the sealed mouse you have been looking for. Really O’ Cool Oil Resistant Keyboard, Workstation Identifier Keyboards, Its Cool Keyboard, L Cool Keyboard, D Cool Keyboard, C Mouse, Simply Cool Touch. Man & Machine, Inc. (“Manufacturer”) warrants to the original purchaser (the “Customer”) that the products it manufactures (“Product”) shall be free from defects in material and workmanship at time of shipment. Manufacturer’s obligations under this Warranty shall be limited to repairing or replacing with the same or comparable item, at its option, free of charge, any product returned to Manufacturer freight prepaid. Manufacturer shall have no obligation under this Warranty or otherwise if (1) the Product has been damaged by abuse, negligence, accident, mishandling, lightning or flood, or other Acts of God, (2) the Product has been affected by normal wear and tear, (3) the Product has not been operated in accordance with its operating instructions, (4) the Product has been altered or repaired by anyone outside Manufacturer (5) adaptations or accessories have been made or attached to the Product which, in Manufacturer’s sole determination, have adversely affected its performance, safety or reliability. If a Product should malfunction or fail during the warranty period stated above, contact the original place of purchase for return options. If purchased directly from Man & Machine, Inc., please submit a Return Material Authorization (RMA). This form can be located on our website at http://www.man-machine.com/forms/replacement-form.php. Please reference your original order number, original order information and complete description of the problem on the form. Returned Products must include the RMA number clearly marked on outside of the package. Manufacturer will not be responsible for any unnecessary items included with any returned Product. THIS WARRANTY IS THE EXCLUSIVE WARRANTY FOR ANY PRODUCT. MANUFACTURER SPECIFICALLY DISCLAIMS ANY AND ALL OTHER WARRANTIES OF ANY KIND, EXPRESS OR IMPLIED, INCLUDING ANY WARRANTIES OF FITNESS FOR A PARTICULAR PURPOSE OR OF MERCHANTABILITY. MANUFACTURER SHALL NOT BE LIABLE IN TORT, INCLUDING NEGLIGENCE OR STRICT LIABILITY, AND SHALL HAVE NO LIABILITY AT ALL FOR INJURY TO PERSONS OR PROPERTY. MANUFACTURER’S LIABILITY FOR FAILURE TO FULFILL ITS OBLIGATION UNDER THIS LIMITED WARRANTY OR ANY OTHER LIABILITY IN CONNECTION WITH A PRODUCT SHALL BE LIMITED TO THE AMOUNT OF THE PURCHASE PRICE RECEIVED BY MANUFACTURER FOR THE PRODUCT. THE REMEDIES STATED IN THIS LIMITED WARRANTY ARE THE CUSTOMER’S EXCLUSIVE REMEDIES AGAINST MANUFACTURER REGARDING ANY PRODUCT. UNDER NO CIRCUMSTANCES SHALL MANUFACTURER BE LIABLE FOR ANY INDIRECT, INCIDENTAL, SPECIAL OR CONSEQUENTIAL DAMAGES, INCLUDING LOST PROFITS AND REVENUES, INCONVENIENCE OR INTERRUPTIONS IN OPERATIONS, OR ANY OTHER COMMERCIAL OR ECONOMIC LOSSES OF ANY KIND. THESE LIMITATIONS AND DISCLAIMERS ARE NOT MADE BY MANUFACTURER WHERE PROHIBITED BY LAW. SOME STATES PROHIBIT LIMITATIONS OF WARRANTIES AND THE CUSTOMER MAY HAVE ADDITIONAL RIGHTS IN THOSE STATES. All warranty repairs or replacements will be returned freight prepaid by ground service to any destination within the Continental United States of America. Charges for repairs/replacements shipped back outside this region are the responsibility of the end user. SKU: MM. Categories: Medical Grade Mice, Waterproof Keyboard Product Line, Courtroom Keyboards And Mice, Industrial Keyboards And Mice - Waterproof, Premium Keyboards and Mice For Dentist Offices.